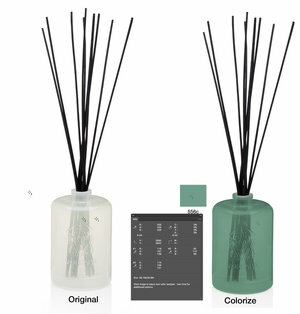 If you have a product with different colors, sometimes we can do a photoshop adjustment to save time. Read this article to learn more. If you want to change the color of one product to another this is called either Hue Shifting or Colorways. Changing the color of your product to other colors in Photoshop seems like a great way to save a bunch of money. However, we’re very cautious about accepting jobs where Hue Shifting is a part of the order and there is a great misunderstanding about the ability to accomplish this with professional results. What Can & Can't Be Hue Shifted? A dark blue can shift to a dark red very easily without issues. However, dark blue struggles to shift to a light red and the bigger the difference, the more it falls apart and looks fake. A color within a complex pattern or text & cannot easily be shifted to another color. For example: if the text is red & the background is pink, the pink could not be shifted without manually selecting each letter resulting in hours of work. Advanced Hue Shifts cost $80 an hour in 15min increments. If an object doesn't have any color ( white, black or clear ), it can't be hue shifted to another color. The only way is to add color to the item using a method called Colorizing. Colorizing tends to look fake and is not recommended. Start a shot list of using the excel spreadsheet shot list. Itemize out each final photo you'd like and the color you want the product changed too. We'll send and estimate and if you approve you can place the order.